What happens when gravity suddenly depletes down to a fraction sending everything and everyone not tied down to the sky? It's the delightful premise of the new Image Comics series, 'Skyward,' from Joe Henderson (showrunner of Fox's Lucifer) and artist Lee Garbett (Lucifer, Loki: Agent of Asgard). Not every apocalyptic event has to be a bleak wasteland of terror and savagery. Sure, the sudden loss of gravity sent countless of people into the sky and presumably to their death, the "low-g life" twenty years later is just the norm and being tethered to your surroundings is just an everyday thing. For Willa, who was just a baby when the event happened, doesn't know life any other way but gravity-lite. Yet she yearns to travel and see the world beyond the confines of Chicago but her dad has other ideas. 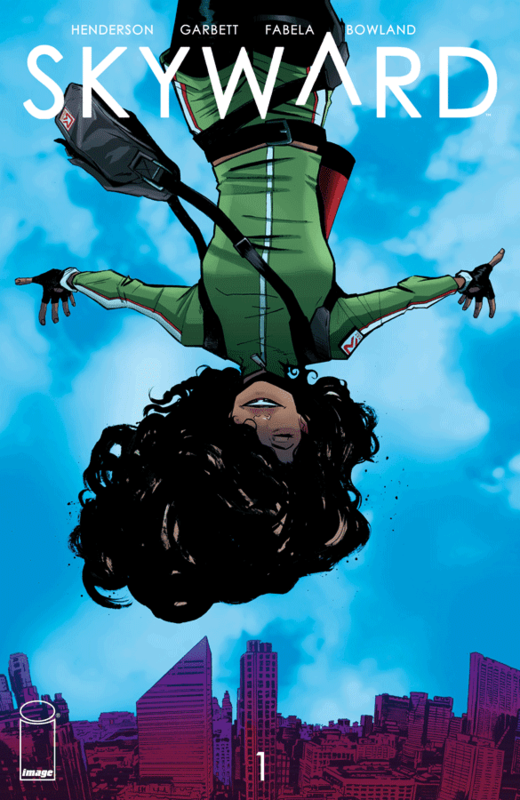 Henderson, Garbett, and colorist Antonio Fabela work in such great harmony to present this awfully bright and sunny reality without much gravity featuring a likable and spunky young woman whose enthusiasm and personality carry the issue. Henderson's dialogue is light and endearing, Garbett's lines are sharp and inspired, while Fabela's colors are rich and striking. It's hard to say a negative thing about it. Some people have said not a lot happens or there isn't enough action in this first issue. I say plenty of things happen and as you would expect in a debut that has to build a world built on a fantastic premise, 'Skyward' lays the groundwork perfectly. There's still a lot of mystery surrounding the event and Willa's dad seems to think he knows the cause but the way it's all portrayed with so much wonder comes across as simply awesome. Garbett's ability to convey the weightlessness of coffee suspended in air, of Willa being slingshot into the sky or drips of sweat floating upwards is a marvel to behold. Just seeing Willa's smiling ear-to-ear as she floats across the sky over the cityscape with the sun beaming on her face is infectiously joyous. This is not some drab alt-world full of brooding antiheroes but an imaginative fantasy that can be described as an allegory for an overprotective father trying to keep his daughter from soaring both literally and figuratively. 'Skyward' is a beautifully told tale that is creative and full of wonder. What would it be like to live with very little gravity around you? Things are bound to get dark but so far this gorgeous and fun debut is intoxicating. It has plenty of heart with mysteries to unfold in the coming issues. This is not to be missed.